Sometimes you just know the best when you see it. The 2015 RAV4, the best choice is the only choice. 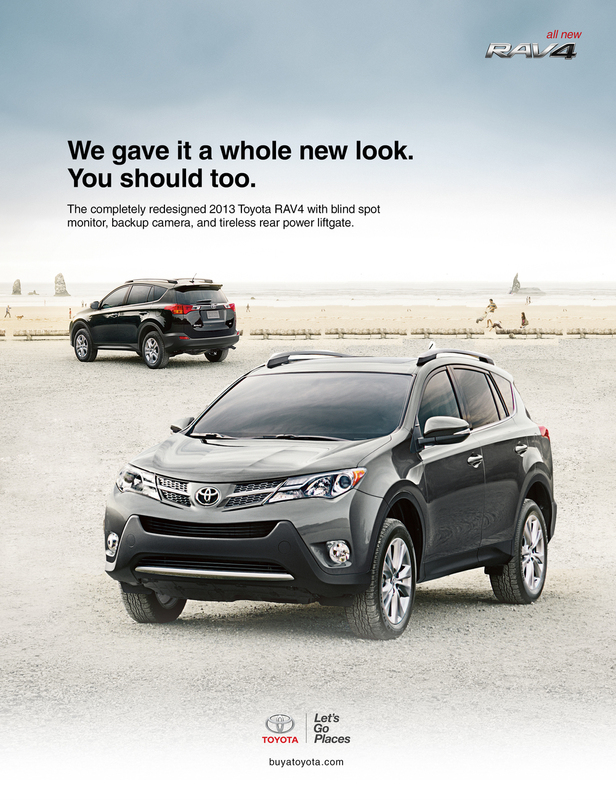 The 2014 Toyota RAV4 is the new generation of crossover SUV, with bold new styling for a new generation. Automatic power liftgate, standard back up camera, and available navigation are just a few of the features you'll find in the 2014 Toyota RAV4. A lot of people say our generation is "lost", but with the new RAV4, you know you're heading the right way. We concepted this commercial to attract a younger audience who are constantly doubted. I also helped illustrating storyboards, location scouting, casting, styling, and art direction on set. This is currently airing in the Southeast and Gulf states. The first Ft. Lauderdale Auto Show program highlights the changes made to the new RAV4. When folded, it reveals the biggest change, the tireless rear power liftgate, and dogears the page so that the user will immediately bookmark that page in their Auto Show program. The others supplementary print showcases a more personal tone for this demographic. This ad was featured in the Ft. Lauderdale Auto Show program. To show people the biggest transformation the RAV4 made (removing the tire on the back of the lift-gate), we created an interactive ad in which the user not only gets to reveal the change themselves, but creates a dogeared marker to the RAV4 in the program.